Clevedon Amateur Swimming Club is based in Clevedon in North Somerset and is affiliated to the Somerset County ASA and the Amateur Swimming Association South West, and are accredited to Swim21 at Teaching and Skill Development level. The Club operates in a friendly atmosphere which encourages its members to develop in a relaxed but committed environment. Members that show commitment will undoubtedly personally benefit from the results of their hard work, as well as having the satisfaction of being a member of a great team of friends. We welcome swimmers of all ages and abilities. Swimmers enter into competitive swimming through our progressive squad structure. The Club holds or attends competitions for all ages and abilities. The purpose of this is to provide a natural progression for the swimmer ranging from the Club’s Novice Gala to National Competition. 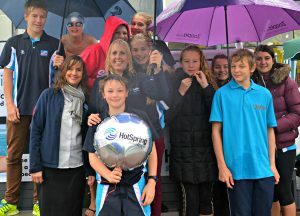 Despite the weather the first event in Bristol was a resounding success with representatives from the Clevedon Swimming Club providing continuous swimming demonstrations to the delight of the many customers who showed up to support them outside in the parking area at Cadbury Garden Centre. 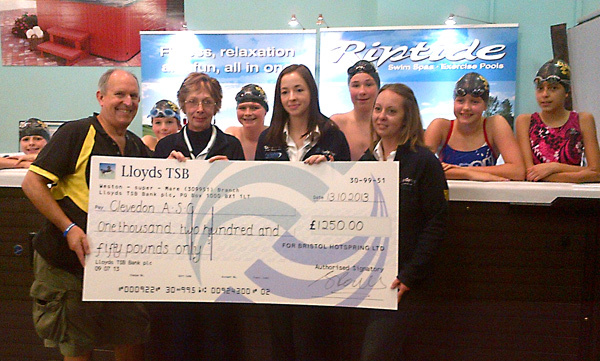 Bristol HotSpring presented a cheque for £1250.00 to the Clevedon Swimming Club and proud to support them in all their swimming ventures. Welcome to Dinnaton Swimming Club. We are a family orientated club which trains mostly at McCaulay’s Fitness and Golf Centre in Ivybridge. All members of the swimming club are also members of McCaulay’s but the club itself remains a separate entity. If you would like to discuss any issues regarding training, competitions or have any general enquiries about the swimming club, please ask any one of the Club’s Committee members (all contact details will be found included in the relevant section). We began in the 1980’s and have developed from a small teaching club into one of the top competitive swimming clubs in Devon, regularly achieving great results in Devon, Western Counties and National Competitions. As a club we remain committed to providing a high quality and comprehensive ‘Learn to Swim’ program through to the provision of specialised training programmes for athletes competing in National Competition. We have also, in the last few years, achieved the ASA Swim 21 Kite-mark in stroke development and Competitive Development, which we worked hard for and are very proud of. We hope that as a member of this friendly, family orientated and successful swimming club, you will take all the opportunities available to you, join in and be inspired to take your swimming to the ‘lengths’ you wish for. Whether you aim to have fun or be the next Rebbeca Adlington or Liam Tancock (or you are the proud parent watching) we welcome you and your family and hope you enjoy the swimming for years to come. Despite the challenging weather conditions Cheryl, Sue and Maisi from Plymouth HotSpring,had a an eventful weekend, joined by youngsters from Dinnaton Swimming Club from Ivybridge a ‘Swimtastic’ time was had by all. The Club had a good supply of willing Swimmers to brave the weather and swam all day!! Plymouth HotSpring are pleased to announce that they are sponsoring Manor School, Ivybridge. The school has their own Swimming Pool and are keen to represent us at their various sporting events. Mrs Karen Dixon, Headmistress is enthusiastic about getting involved in the local community and we feel this will be a great partnership for both of us. Plymouth HotSpring made a cheque handover on Sunday 25 May to the delight of the Children and teachers in attendance making this a joyful event for everyone. 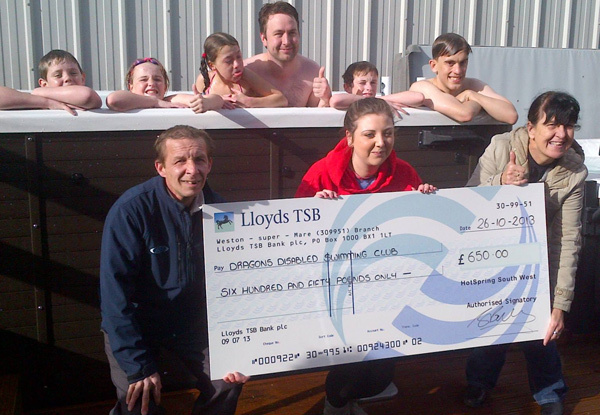 The Dragons Disabled Swimming Club is one of the leading disabled swimming clubs in Wales. We have been running since 1993 and have produced swimmers who have gone on to represent Wales and Britain at National, World and Paralympic level. Some swimmers to have come through the ranks at the Dragons include one of our coaches and 11 times Paralympic Gold medallist David Roberts CBE, Paralympic Gold medallists Gareth Duke, Liz Johnson and Nyree Lewis, and Paralympic medallist Rhiannon Henry. Our aim is to offer competitive minded disabled swimmers the opportunity to compete in competitions at regional and national level. Ultimately the aim of the club is to allow swimmers the opportunity to develop to a standard where they could achieve selection for the Welsh and British teams. We try to enter as many competitions as possible throughout the year to give our swimmers as many chances to compete as possible. Even though the weather threw everything it could at us our swimming club the “Dragons” turned up in force to show the public nothing stops them putting on a Show!! The club members have a couple of things in common a disability and the goal to be a competitive swimmer. “Dragons disabled swimming club” has incredibly produced 9 Olympians since its beginning including 11 Gold Medallist David Roberts which is not to be sniffed at. The clubs main objective is to give people with a disability a chance to take to the water and with encouragement and coaching from Carol and Alan go on to be a Paralympics super star. 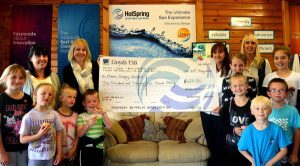 HotSpring South West and Wales is proud to sponsor the club and has provided new kits bearing both the company and the clubs logo Carol said “it has transformed the clubs image and can not wait to attend their next Gala.” Over the weekend each member from the club took turns demonstrating their skills in the Poseidon swim spa to the general public visiting the garden centre this attracted huge interest with crowds huddling around the pool to spectate. Finally Sunday afternoon saw the presentation of the sponsorship funds in the form of a big cheque for £650.00 to the club and the all important group photos including a thank you speech made on behalf of HotSpring South West and Wales to the club Going forward more events are planned and the members of the club will make frequent use of the Poseidon and spas on display at the showroom and all in all a great weekend was had by all.